With just 15 days left until entries close for the inaugural Dezeen Awards, we're announcing the 15 judges who will be naming the architects, designers and interior designers of the year. Would you like to be crowned architect, designer or interior designer of the year at a high-profile awards ceremony in November? If so, then start working on your entries now! Six of the Dezeen Awards categories have been specifically created to highlight the architects and designers producing the most outstanding work. Among these categories, our panel of industry-leading judges will also be selecting the emerging designers and studios who they feel are set to make a big impact on the design world. The winners of these six categories will be announced at the end of the ceremony on 27 November. Together with the three awards for best overall project in architecture, interiors and design, they make up part of the Ultimate Dezeen Awards, a top tier of nine accolades that will honour the most outstanding design talent of the year. The announcement of the nine Ultimate Dezeen Awards winners will be the highlight of the Dezeen Awards ceremony and each winner will receive a special trophy designed by Dutch design studio Atelier NL. There are just 15 days remaining to complete your entries! The deadline is 30 June and we will not be accepting entries after that date. Want to enter a product or project? We have 24 other categories, spanning architecture, interiors and design, that you can also enter. Check out our full list of categories. 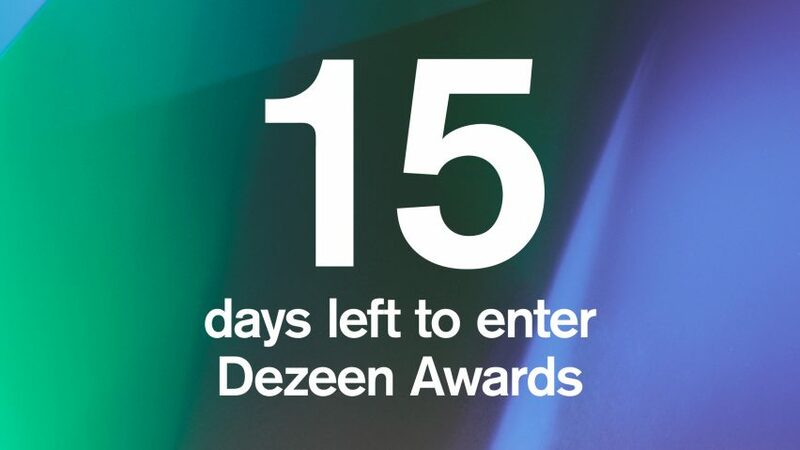 Registering for a Dezeen Awards account only takes a few minutes, so you can get started on your entry right away. The deadline for entry is at midnight on 30 June. Good luck!